Locations of Beachfill Discharge: Liberty Island - North side of Nelson Ave; Padre Island - 11th St. Dodge Island - 11th St. The Liberty, Dodge and Padre Island are on site and conducting dredging and beachfill operations. The Liberty Island is scheduled to work in southern Beach Haven (line around Nelson and Holgate) while the Dodge and Padre are working in? north Beach Haven (line around 12th/13th). And then the dredges will meet somewhere in between. Great Lakes expects Beach Haven to be complete by middle/late May timeframe. Will be determined after real estate acquisition is finalized. Great Lakes Dredge & Dock Company estimates work will take place between April and late June. Great Lakes anticipates progressing 100-300 feet a day depending on the condition of the beach in the area. Crews will close no more than 1000 feet of beach as work progresses along the island (closed sections are "rolling" and advance as the beachfill progresses along the island). Residents and visitors should not have to walk more than several blocks to access an open section of beach. 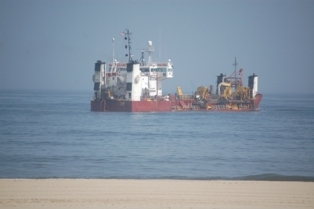 The operation is 24/7 because of the cost associated with mobilizing a dredge to the location.